1) Human CO2 emissions are stabilizing. Peak coal and oil, and current trends make a decrease in emissions very likely before 2050. Atmospheric CO2 levels should reach 500 ppm but might stabilize soon afterwards. 2) According to solar cycles, solar activity should increase after the present extended solar minimum, and 21st century solar activity should be as high or higher than 20th century. A mid-21st century solar grand minimum is highly improbable. 3) Global warming might stall or slightly reverse for the period 2000-2035. Cyclic factors suggest renewed warming for the 2035-2065 period at a similar rate to the last half of the 20th century. Afterwards global warming could end, with temperatures stabilized around +1.5°C above pre-industrial, and a very slow decline for the last part of 21st century and beyond. 4) The present summer Arctic sea ice melting pause might continue until ~ 2035. Renewed melting is probable afterwards, but it is unlikely that the Arctic summer will become consistently ice free even by 2100. 5) The rate of sea-level rise can be conservatively projected to a 290 mm increase by 2100 over 2000 levels. Most rates published are extremely non-conservative and very unlikely to take place. 6) Climate change should remain subdued and net positive for the biosphere for the 21st century. Adaptation is likely to be the best strategy, as it has always been. His solar forecast is a guess and he does not consider the weakening geo magnetic field which is going to compound given solar activity effects upon the climate because they are in sync. Solar has been in a sub solar phase post 2005, and the current solar parameters within this sub solar activity are quite low. 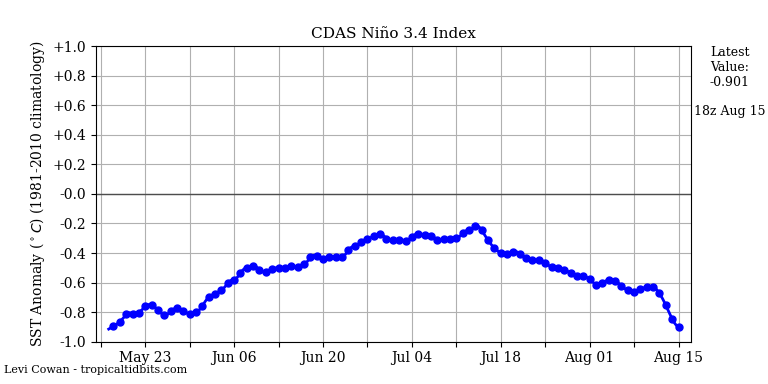 I think low enough to now have a climatic impact by causing overall sea surface temperatures to lower ,while causing the albedo to increase slightly. 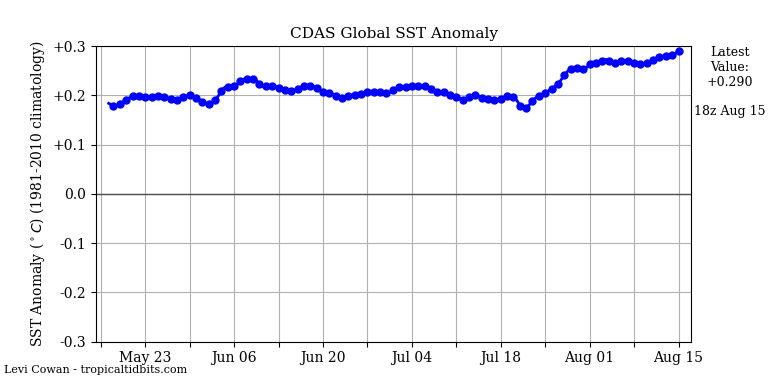 Overall sea surface temperatures seem to be trending lower despite the very recent uptick and this is the key metric to watch in my opinion. If overall sea surface temperatures drop there will be no further global warming. I think now – next few years will be telling, one way or the other. If global temperatures do not fall over the next few years AGW is going to have a lot of life and will be more accepted. If global temperatures fall then AGW theory may get moved to the sidelines. To my way of thinking this period of time in the climate and what it does is crucial. See early comments from Tallbloke, Stephen Wilde at this link. Where will the impact of low solar activity be the greatest? Where the strongest galactic radiation will be. A dry summer is a harbinger of a harsh winter. This is closely related to the strength of the Earth’s magnetic field. Sunny weather in the UK stems from the cold North Atlantic. Water vapor easily overcomes the tropopause barrier when there are more O3 and C14 in the lower stratosphere. 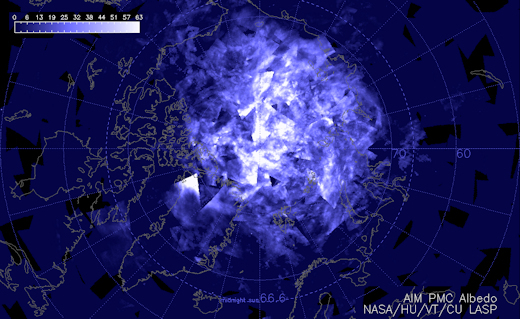 ” For the 4th week in a row, NASA’s AIM spacecraft has observed an increase in noctilucent clouds (NLCs) above the Arctic Circle. This is the latest image showing our planet’s north pole capped in electric-blue. Even small changes of water vapor in the tropopause during the winter have a large impact on temperature changes on the surface. Tks for reposting here – nearly missed it. There is something interesting in the Eddy cycle as in fig 122 of that post. On the lookout for links i compared that chronologically to something else of mine. I did not expect to find anything. Surprise! Five consecutive correlations to events ( I say) quite firmly established of a tectonic nature, very undesirable. 5200 and 3195 are tectonic micro-plate rotations (proving Herodotus as no liar). Ren – I am surprised the overall sea surface temperatures have risen some of late. I think it is temporary. Do you have any thoughts? The surface temperature of the central Pacific has increased. However, the trend is visible. The present solar extended minimum, known as the Eddy minimum, includes SC24 and SC25. A conservative forecast on the effect of the Eddy minimum on temperatures indicates no additional global warming before 2035, and perhaps even a slight cooling. This forecast is also supported by the position of the 60-year oscillation (figure 102), that also indicates no warming for the first 3 decades of the 21st century. …forecast of essentially no change in temperature for the next 200 years, allowing for ±0.5°C multidecadal changes. But Ren I expect overall sea surface temperatures to drop as we move forward. Do you? How about you oldbrew? I think solar is now weak enough that it should have that effect. 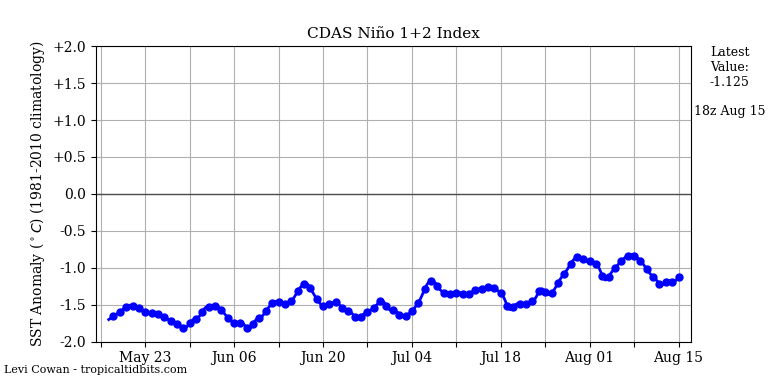 Salvatore if El Niño developed, the temperature could rise, but Humboldt’s current is cold. 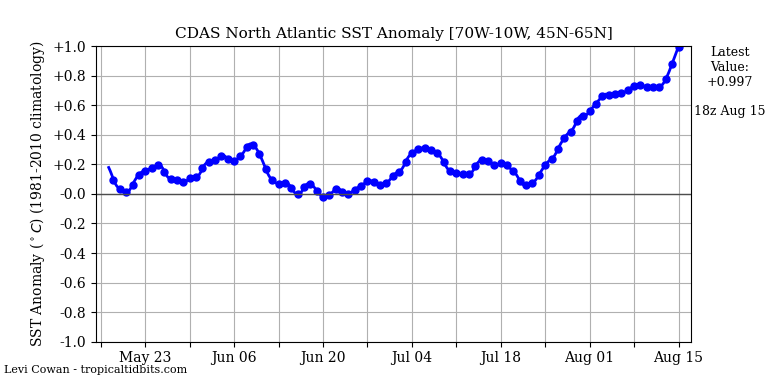 We are going to have to watch the overall sea surface temperatures which I think will keep trending down if solar is indeed the driving force. old brew – I see but overall sea surface temperatures still warm, global temperatures still warm this has to change. Sooner the better.